If you were to ask me years ago if I would have ever wanted to go to a Comic Con, I would have laughed in your face. I would have said that it was for dorks or losers or some other cliched response. I always felt that these conventions were for the outcasts and those who did not like the "normal" entertainment likes such as popular television and film or forms of entertainment that were more realistic. Today, after attending the Great Allentown Comic Con in Allentown, PA, I must admit I was wrong. Every person at the convention, whether they were the vendors, artists, workers, or the attendees themselves were exceptional human beings and I felt weirdly at home. I would have never envisioned myself attending such an event, but alas, I did and words cannot describe how incredible and amazing it was. All of my preconceived notions were 100% wrong. Upon walking into the Merchant's Square off of South 12th Street, you are immediately greeted by several collectibles shops, each with different attractions. Since today was Comic Con, the action figures and comic books were out in full force. On the second story, I walked into the ultimate heaven; the Pro Wrestling Shop. Everything from VHS tapes, to signed memorabilia, to almost every action figure imaginable was in that store and I could have spent thousands and thousands of dollars in there, however, I held out. I'll come back next week after I get my paycheck. Walking around the facility, it has an old time feel to it. Known as a train museum and essentially, an indoor flea market, the feeling fit the space. After checking out all of the shops and finding where the panel rooms were, I eventually made my way to the showroom where my ultimate goal await: Meeting Austin St. John. Austin St. John, for those who do not know, was the Original Red Power Ranger in the 1993 mega hit show, Mighty Morphin' Power Rangers. He played Jason Lee Scott, the bold leader of the five "teenagers with attitude." St. John remained on the show about half way through the second season where he ultimately walked out due to disputes with the producers and other higher ups. Since then, St. John worked as a bartender, a medic and most recently completed a four-year stint as a medic overseas, helping American troops. He has been working the Cons lately and as fate would have it, came to the one-day event in Allentown, the closest one to me. I immediately bought a ticket and a professional photo op ticket just to guarantee myself meeting my childhood hero. 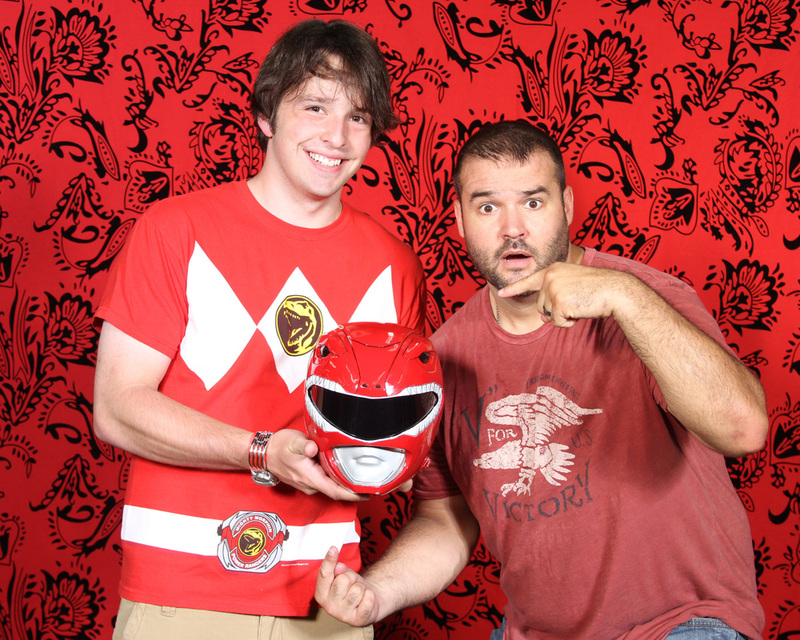 I have looked up to Austin St. John/Jason for 20 years now. Yes, 20. He has been a role model and a childhood hero whom I attribute most of my development as a person to, other than my mother and father. The character of Jason was a leader who was strong and had standards he did not dip below, no matter the circumstance. He fought for what was right and just and would do anything for the betterment of the team. His integrity, honor, discipline, and strength, both inner and outer, along with his confidence were all perfect qualities to admire as a youngster and they have stuck with me since I was three years old. As I approached the showroom floor, my eyes were fixated towards finding his booth. When I did, I was locked in and did not care about all of the other happenings around me, so far at least. I stood in line patiently, picked out a photo I would love to have him sign and shelled out the extra money for a personal picture. When he arrived at his table, it was like a religious experience. There was an indescribable aura surrounding him. I was completely star-struck. When I got up to meet him, we made eye contact and introduced ourselves; I was near speechless. In a flurry of words that I can't quite remember due to the importance of the moment, I professed how much of an honor it was to meet him, how he had been a hero of mine and how this moment was one I had hoped would happen for my whole life basically. He looked incredibly humbled and was everything I hoped he would be and more. We took the picture and then later, I took my professional photo op with him as well. When I walked up to the black taped "T" on the floor, we shook hands again and he asked, "Do you want to hold the helmet?" Speechless. My eyes lit up like never before and I exclaimed, "ABSOLUTELY!" Me. Holding the Red Ranger Helmet. Austin St. John on the other side.... The perfect picture and a moment I will never forget. An hour passed and I was sitting in the panel discussion room for the Mighty Morphin' Power Rangers segment of the convention. Both Austin and Karan Ashley, Aisha, the second Yellow Ranger, fielded questions left and right about the show and their experiences and their personal lives from the show as well. It was an amazing experience and something, like I said, I would never have dreamed of actually happening. After the panel concluded, I walked out of the GreatAllentown Comic Con experiencing everything I wanted to see and do and feeling on top of the moon; one could say, "Morphinominal!" The highlight of the panel, of course, was when the two former Rangers cried out their morphing calls. Goosebumps ran up and down my body when I heard Austin yell, "Tyrannosaurus!" live. The experience was amazing today and for someone who thought he'd never enjoy a Comic Con, I had the time of my life there today. It may not be Power Morphicon or the Comic Con in San Diego, New York, or Philadelphia, but Allentown was fantastic. It was a quick, easy drive that was made better by the overwhelming good character of people who attended and were the main attractions. One of the best days I've ever had. It was an incredible moment meeting you today and that is an understatement. Ever since I was younger, I wanted to be Jason; I wanted to be the Red Ranger. Your dedication to what you believe is right and how you handle yourself is admirable and has inspired many, many fans like myself to be better people and our own versions of Jason. Your humility towards the fans and general attitude at Comic Con today was amazing and I am honored to have met you. You continue to inspire and motivate others to achieve and better themselves. I can't speak for everyone who is your fan, but for myself, you will always be a hero and role model to me and today, a dream came true. I cannot thank you enough and will always continue to support you. So happy to have you 'Back in Action."